So my intention this week was to do a review for the most-recent Battlestar Galactica Expansion: Exodus. The problem is that this is one monster of an expansion. Ultimately, after sitting down with Exodus and pouring through the rules, this expansion seriously changes the game significantly and in actuality, this changes the core game, adds components to the game and significantly expands the thematic elements of the game. So my dilemma is even though I have played BSG at least 40 times in the past couple of years, there's simply no way to give this an honest to goodness review without trying all three elements of the game live and in person with other wannabe Cylons. This expansion seems to be a direct response to the addition of the Pegasus option in the previous expansion (fittingly called Pegasus). This certainly balances out the strength of adding The Pegasus spots to the Human Fleet. The Engine Room is especially strong as it guarantees a jump icon and in recent games it's as if the humans are throwing a kegger in that spot because characters eventually end up there to guarantee a late game jump. The Cylon Fleet adds a whole new playing board to the game. . .it corresponds with the original Galactica board and essentially enables the Cylons to keep an obscene amount of pressure on the human players. "The Cylons are coming trala trala. . ."
In the original setup, the Cylon fleet is kind of a random element as it is card driven during the destiny deck resolution phase. The Cylon Fleet board makes space battles much more real and tactical in nature. Essentially keeping the Clyons on Galactica (and Pegasus') tails for the bulk of the game. I personally love this part of the expansion and can't wait until I get my first I'm a cylon card that enables me to take helm of the fleet. So, this is a very subtle addition to the game. . .it essentially takes the "You are. . ." and the "You Are Not a Clyon" cards and spices them up. So essentially, if you thought BSG did a great job of building paranoia before, now it's been tripled. Basically, if you play with these new cards you are going to be itching to toss nearly everyone out the airlock as humans are essentially forced to take on side quests and "goals" so the greater human cause does not get the shaft in the endgame. Of course most of these individual goals are going to look nefarious. . .causing your mates to question your motives and reach for that air lock button and toss your arse into the freezing void of space. This is where this expansion really completely turns the game on it's head. This is a very, very thematic addition to the game where nearly all of the characters from the show are inserted into the game. . .and sometimes they will help and seemingly often times they will frack up your plans. It's really hard to get my head around this part of the expansion as it really is creates a whole new experience. Clearly, I'm going to need to dive into this before I can really spell it out for you. 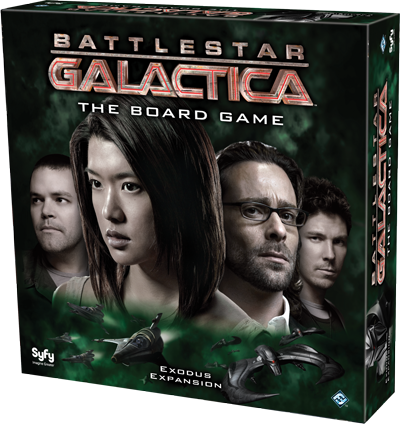 Anyway, that's my dilemma, a great game has been given a whole new look via expansion and now I need to get some fellow BSG'ers together for some marathon sessions to work it all out.